Up until this point I’d never quite grasped the concept of why Baked Potatoes were so popular, let alone enough to fill you for an entire lunch or dinner. Yet I thought it was about time to experiment and try to understand this choice that so many raved about. 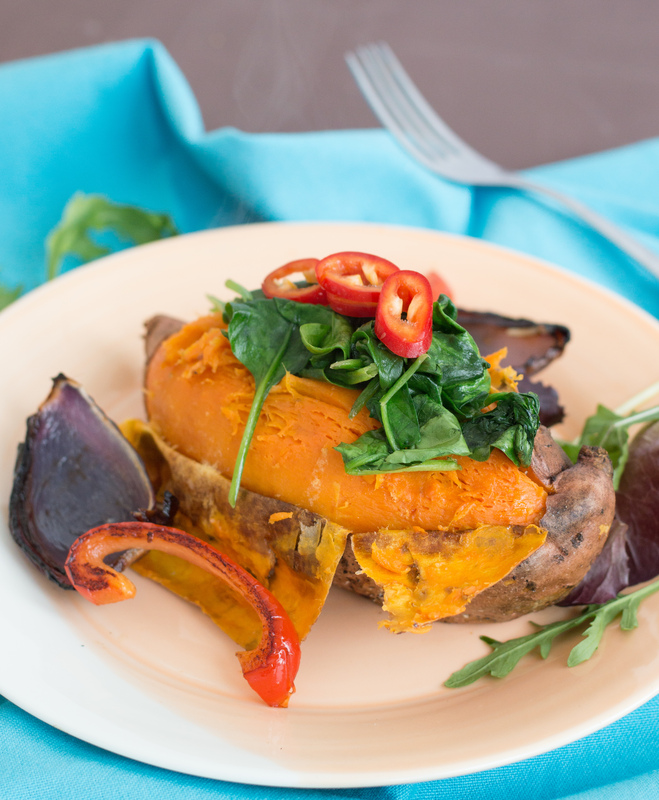 Like Carrots, Sweet Potatoes provide an excellent source of Vitamin A, which strongly supports your eyesight and helps to improve your immune system too. When baking, sweet potatoes can be treated exactly the same as white potatoes in terms of the length of cooking time and how they are baked. Depending on the size, you may have to adjust the cooking times slightly, however most will be cooked between 45 minutes to an hour, and if you do leave them in slightly longer it’s not too bad as the skin surrounding the potato will offer some protection. Even though I’m not a vegetarian, I still enjoy meals without meat or poultry and instead bulk them up with extra vegetables, pulses and lentils etc so there’s plenty of protein that will keep me fuller for longer. These meals can be just as filling as those that contain meat or poultry, trust me! This delicious combination of the sweetness of the potato, along with the baked red onion that’s offset by the chilli really does offer some fantastic flavour pairings. Enjoy! Pre-heat the oven to 180C (fan-assisted) and pierce the potatoes with a fork all the way around. Place onto a baking tray and rub thoroughly with the olive oil. Add the red onion quarters and drizzle over the juice from the slice of lemon. After this time, remove the red onion quarters and continue to bake the sweet potatoes for a further 30 minutes. With 15 minutes remaining, heat a medium-sized frying pan and add a little olive oil. Cook the red peppers for 5 minutes, then add the chilli for a further 5 minutes. Finally add the spinach and allow to wilt, then return the red onion to the pan to reheat. 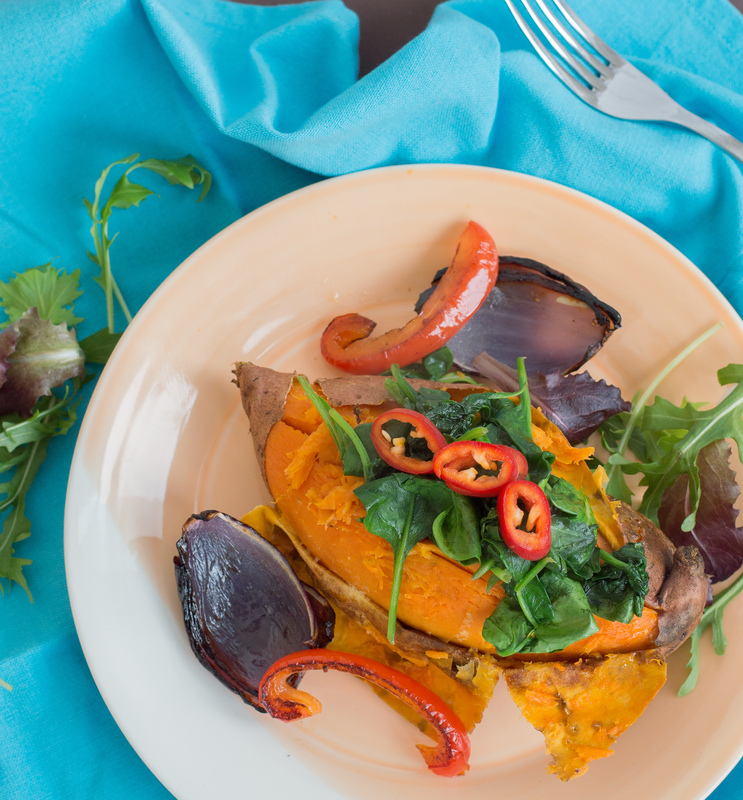 Once the oven time is up, remove the sweet potatoes from the oven and carefully pierce the skin using a sharp knife to open up. Assemble the frying pan ingredients on top of each potato and add some additional rocket leaves. Finish by drizzling over the balsamic vinegar and serve. I am amazed by your variety of recipes. New methods of cooking sweet potatoes will break the boredom and keep every member in the family enthusiastic.